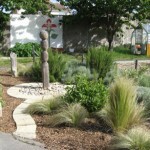 The environmental garden at Holy Trinity Primary School was started on a large plot of overgrown ground in 2008 with the donation of a show garden from the RHS Hampton Court Flower Show. This donation kick-started the development of the area by the Garden Group which is made up of parents, governors, teachers and friends of the school. The aim of the group is to provide a garden that allows children to experience the wonder of nature and thrill of growing plants and vegetables. As well as being a place to experience gardening hands on, it is also a space that provides learning opportunities for many other subjects. The garden now has an area of 19 raised beds, one for each class. 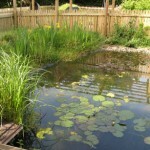 There is a bird garden with a hide, a large wildlife pond, a quiet memory corner and a WWII garden. 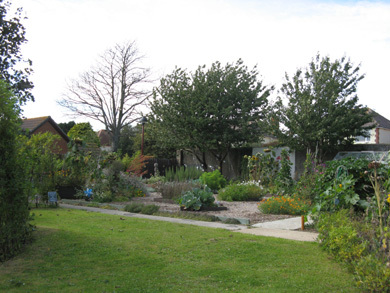 There are 8 water butts around the garden and three large compost bins. There is also a small wind turbine and solar panel. 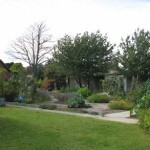 All of this has been achieved with the hard work and fundraising endeavours of the Garden Group. None of the school’s education budget is allocated to this garden. The garden is home to a great deal of wildlife and there are special bird boxes, bat boxes, bee hotels, hedgehog houses and a frog home. 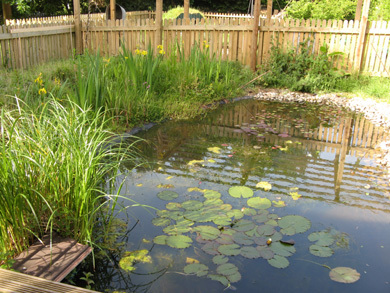 The garden had been the Winner in the Schools section of the Dorset Wildlife Trust, Wildlife Friendly Garden, once in 2011 and again in 2015. In 2012, the Garden Group were proud to open for the National Gardens Scheme and raised over £400 for charity. The NGS Open Weekend has now become an annual event in the school calendar. A floodlit school carol service is held every December in the garden and is very popular. The garden is also used by other groups from outside the school and will always be there for all the community to benefit from. 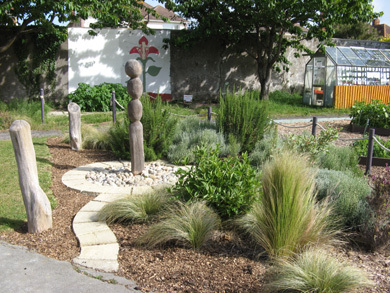 In 2015 the Garden Group were able to make a start on the long anticipated Jurassic Garden which was designed for the school by year 2 Horticulture Students from Kingston Maurward College who treated it as a project for their course work. Reliefs of fossils around during the Jurassic period have been created by a local craftsman. As a school situated on the Jurassic Coast, we hope that the finished garden will help the children to understand a little more about what ‘Jurassic’ means. The Garden Group volunteers meet regularly to help maintain and improve the school garden and to hold the occasional BBQ. If you are interested in being involved with this worthwhile aspect of school life, please leave your details with the school office.